A Double Dump Gate (DDG – Pneumatic Operation) unit is a series of two Dump Gates (Flap Gates) serving as an airlock device that allows material to pass from one phase of an industrial process to another, where a differential pressure or temperature exists and needs to be maintained. 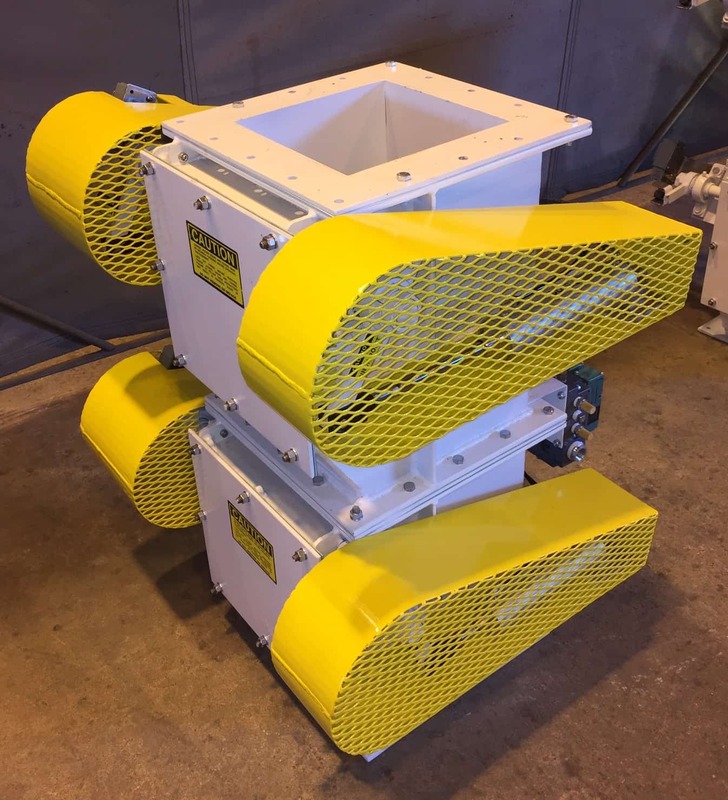 The DDG is also referred to as a Double Tipping Valve, Double Flap Gate, or Double Dump Valve, and are most beneficial when handling abrasive materials. A DDG unit is superior to a rotary airlock which, by design, allows leakage to occur. The leakage occurs at a higher rate with abrasive particulates and high differential pressure, which through the sweeping motion of the rotary airlock valve, degrades the controlled airlock seal, deteriorating the effectiveness of the air lock. Our DDG units are designed with perpendicular seating surfaces, allowing our units to require less maintenance to maintain the effectiveness of the air lock. The standard BGRS DDG is electro-pneumaticly operated. These valves can be controlled via owners logic controller or BGRS control panel (120 VAC, 220 VAC, 12V-DC or 24V-DC). Units may be equipped with low-pressure hydraulic cylinder actuators for applications where suitable hydraulic power is already available at the equipment location. Our DDG range in size from 6” to 36” throughput.